Following an easy composting method has got be easier than what many of us are doing now. I'll use my town, High River, Alberta, and how many of us High Riverites handle our yard waste, as an example. We weed our gardens, rake our leaves and mow our lawns. 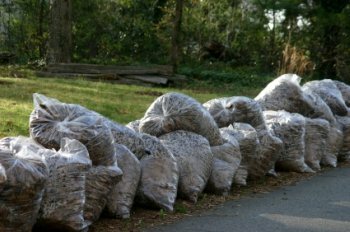 We put the grass clippings, weeds and leaves in bags or bins and load them into a vehicle - or toss the bags into the garbage. We drive our car full of our bags and bins to the garden waste depot where we dump them. The town then loads the grass, leaves and weeds from the depot into big trucks and hauls them to a large compost facility where it's composted. We drive out to the compost facility, buy a load of compost and put it on our lawns and garden beds. What is the Easy Composting Option? Leave it alone and let nature break it down. That's really all you need to do... Here are some of the things you really don't need to worry about or bother with. Don't worry about the size of your pile. Here are a few easy composting tips to help with any problems that might come up. You want to mix browns and greens. A quick review - browns are dry carbon rich materials such as leaves and shredded paper - greens are moist nitrogen rich materials such as green weeds, grass, and most food waste. For an in depth review of what qualifies as a brown and a green check the compost ingredients page. If nothing seems to be happening check the moisture first and add water if it is too dry. Ideally you want it as moist as a squeezed out sponge. If it stinks you have too many greens and/or the pile is too wet. Add more browns and stir it up a bit to give it air. Bury food wastes a bit in the pile to avoid any critter problems. Another easy composting option is to separate your food wastes and toss them in a garden compost bin. Want to Make Easy Composting Even Easier? Location One - Note where you generate your composting materials and build a compost pile as close as possible to there. This avoids hauling all that stuff elsewhere. Location Two - Think about where you need compost. Is there a part of your garden that needs a big dose of compost? Are you planning to start a new garden bed somewhere? Locate your compost pile there and when the compost is ready all you'll have to do is push it around a bit. Location Three - Build small compost piles in your garden as you are weeding, harvesting and dead heading. When the compost rots down it will already be in a place where it can be used. How easy is that? There are many advantages to composting the easy, albeit slow, way. Easy Composting saves a ton of work. Better Biodiversity in the compost. A big part of compost's benefit is from the range and numbers of organisms you bring to the soil. Hot, work intensive, composting tends to kill many beneficial members of the soil food web. This method is cooler and so greater biodiversity results. Due to better biodiversity in the compost, it is more effective in disease control, especially of soil borne diseases. Beneficial Fungi are not disturbed. The usual turning and screening of compost piles really messes with the beneficial fungi in the compost. With better fungi you have better moisture and nutrient cycling so you'll need less water and fertilizer. Nutrients in the compost, especially nitrogen, are less likely to be lost to the air. Easy Composting is the ultimate garden multitasker. Just a thought or two on location and you easily end up with a nice soil amendment that feeds both your garden and the soil organisms and took almost no work. There are a few downsides to this method, especially for the impatient people among us - those who want that compost ready already. Here are a few of the disadvantages. The process takes a long time. Depending on where you live it will take anywhere from three months to a year to get finished compost. Weed Seeds and Pathogens may or may not be destroyed at the cooler temperatures. Final compost may be chunky as bigger bits of high carbon material take an extended period to fully decompose.